If you haven’t looked in a while, please check our chat window section (Account Dashboard > Setup > Design Customization > Chat Window) for more color customizations. With this new feature, you will be able to customize the chat windows to match your website! 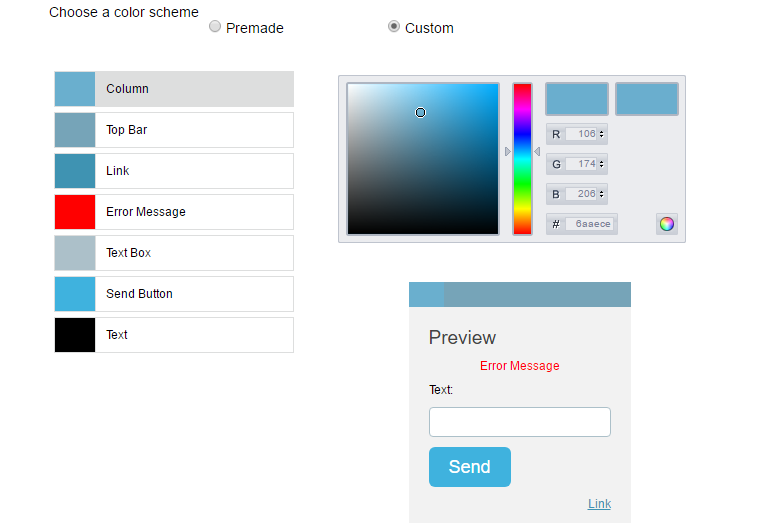 Premade are the color schemes that you can select quick to meet your color preferences. Below are the tools to customize the chat match your CSS/Site style. To do this, you will be using RGB color picker or enter in the color hex code (here are some color hex codes as an example http://www.color-hex.com/). Just select a category you wish to edit (Column, Top Bar, etc.…), edit the color and check the preview box below. We hope with this new tool it will help you integrate OCC into your site more cleanly. This entry was posted on Thursday, May 4th, 2017 at 10:28 am	and is filed under Uncategorized. You can follow any responses to this entry through the RSS 2.0 feed. Both comments and pings are currently closed.